CyberSpaceLand is a VJ performance with some software, several gadgets, some network packets and a person who moves around a lot operating it all. VJ Ãœbergeek enters queries into the CyberSpaceLand search engine, on topics ranging from cheerful memes to existential angst. The search results become live-animated on-screen visuals: funky, fluffy, and maybe even cool. 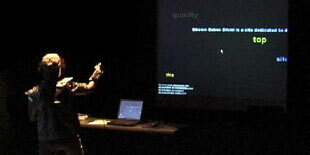 Hyperactive Ãœbergeek controls the visuals in realtime with a variety of gadgets ranging from dance pads to drumsticks. 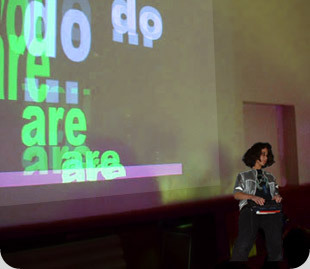 Amy Alexander (VJ Ãœbergeek) has performed CyberSpaceLand in a variety of venues from nightclubs to festivals to museums to the streets. 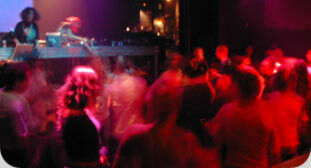 Performances vary with the setting, ranging from more theatrical and character-based to laid-back and ambient. The content and visuals have evolved over the years, and no two performances are ever the same. You really want to know more? can be found on the video page as well as links to more! Want to keep up with the news and Amy Alexander's other projects? and a full show list of the CyberSpaceLand Textperience in action!.